Austrian "German" Line, part 2... and Merry Christmas! I thought that for the final post of 2011, I'd do a sort of Blog Christmas card, and use the opportunity to show the nine regiments of Minifigs Austrian "German" line in helmets which still compose a big chunk of my army. And then I had the doubtless ill-considered idea of a Christmas song parody. For better or worse, here it is! armies set out for Marengo. while boots are marching very slow! with every OOB I write. May your troops be well painted, for the fight. And may all your Infantry... wear white! He's a quick review of the troops by Archduke Charles (Erzherzog Karl) himself, as they assemble for church services on Christmas Day - perhaps in Salzburg? I.R. #9 Czartoryski, with apfelgrun ("apple green") facings and yellow buttons. This regiment was recruited in the Low Countries (Walloon) until those territories were lost, then later in Galicia. All of these Minifigs were painted by me some 30+ years ago. They certainly aren't up to my current painting standards, but I still love their hand-painted standards, and they are all true veterans of the tabletop! Note the inevitable wagon of the Austrian supply trains! I.R. # 1 "Kaiser Franz", with pompadourrot facings and yellow metal buttons. This regiment was recruited in Moravia. The personal regiment of the Emperor, this facing color is sometimes described as dark red; here I have chosen a more magenta shade which is close to that indicated in Hollin's work below. The bridge was scratch built, as were the rivers. There is an excellent table of facing colors at the Napoelon Guide site with examples of the shades at the Histofig site and also perhaps the most definitive illustration of the various shades by Dave Hollins and Mike MacGillivray here on the DeepFried HappyMice site. Finally, there is a table of best-match Vallejo colors corresponding to many of these here at Iannick's great Clash of Empires site. ADD April 2012: From a TMP post today comes this interesting link to Tranquillo Mollo's chart of facing colors (names and actualk shades depicted) for the Austrian Army in 1815, all branches, from the Anne S. K. Brown collection. I.R. #22 "Coburg" with kaisergelb ("emperor yellow") facings and white buttons. This regiment was recruited in Illryia, later changed to Moravia. I.R. # 25 "Zedtwitz", which changed names often during the Napoleonic wars. Its meergrun ("sea green") facings and white buttons, however, did not. The regiment was recruited in Bohemia. This is I.R. #49, Baron Kerpen, with hectgrau ("pike grey") facings and white buttons. It now appears the shade should have a decidedly blue tone to it, rather than the neutral shade depicted here. This regiment was recruited in Lower Austria. Here is I.R. # 44, "Bellegarde", with krapprot ("madder red") facings and white buttons. This regiment was recruited in Italy, later changed to Germany. Hastening to the Church we have I.R. #4, the famed "Hoch und Deutschmeister" regiment, recruited in Lower Austria. Showing their himmelblau ("sky blue") facings and yellow buttons, all the officers and many of the men were members of the Teutonic Order, and the Inhaber of the regiment was the current Grand Master of the Order. This one definitely warrants an "elite" rating! I.R. #17, "Reuss-Plauen. Recruited in Bohemia, this regiment had lichtbraun ("light brown") facings and white buttons. I.R. # 16, "Baron Terzi", later "Erzherzog Rudolph", and still later "Lusignan". This unit had the unusual facing color of violett ("violet"), later changed to sulphur yellow. Recruited in Styria, it had yellow buttons. "It was Dec. 24th ,1818 in a small Austrian village called Oberndorf, just hours before Christmas mass and pastor Joseph Mohr was in a bind. His musical plans for the evening church service were ruined since the organ of his church (St. Nicholas Kirche) had broken down recently due to a recent flooding of the nearby river. What could he do? In a moment of inspiration, he grabbed a Christmas poem he had written two years earlier and quickly set off to the neighbouring village, where his friend Franz Gruber, the church organist, lived. It is believed that Franz Gruber was able to produce on that night in just a few short hours, the first version of the world renowned Christmas hymn “Stille Nacht”, written as a guitar accompaniment. The song that we sing today is slightly different from the original version - it is believed that folk singer and choir groups altered the original melody slightly as they performed the carol throughout Europe in the ensuing decades. The English version we know today was written by the Episcopal priest John Freeman Young, however the standard English version contains just three verses, whereas the German version contains six. (only verses 1, 6 and 2 from the original Joseph Mohr version are sung in English.)" Wishing all of you, both near and far, a joyous Christmas, and happy, healthy, and prosperous New Year! May there indeed be Peace on Earth, and the hope that one day wars will be limited to those we fight on out tabletop, as H.G. Wells himself proposed! I picked this book up almost 2 years ago, coming across it by chance (and at a very reasonable price - $25, about half the cover price IIRC) at a bookseller at Battlegroup Boston's annual HAVOC convention held outside Worchester, MA. 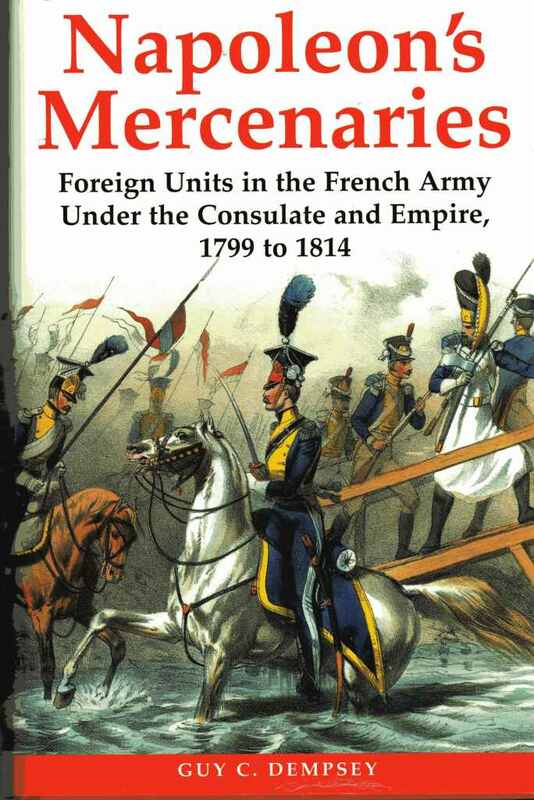 Authored by Guy C. Dempsey, and published by Stackpole books in 2002, this 300 plus page hardcover volume is a treasure trove of information about the foreign troops in French service under the Consulate and Empire, from 1799 - 1814. This ambitious work covers more than fifty various "foreign military formations that a)were integral units of the French army during Napoleon's political reign from 1799 to 1814, b)were intentionally and exclusively recruited from populations that were not politically a part of France when the unit was formed, c) were paid by the French Treasury, and d) fought under a French flag or standard (if the unit had one at all)." (quoted from the author's Introduction). The book also contains 16 glossy pages of black and white paintings and uniform illustrations, all taken from existing sources. The front cover of the book (shown above) depicts Vistula Legion Infantry and Lancers in color, and the front and end papers have color illustrations of another 20 or so uniforms by Noirmont and Marbot. If one were to have everything that once could possibly wish for form a book like this, the only thing lacking would be more color illustrations of the units covered, where sufficient information is available. Still, between the black and white images and those cited above, there is certainly sufficient information for the wargamer to paint up many of these intriguing units. There are also notes regarding the Organization of Piedmontese troops, 1799 - 1801, Organization of Lithuanian forces in 1812, as well as a brief listing of Foreign units in 1815. Phew! In summary, if you have any interest in these colorful and unique units, whether singularly or collectively, this book would be a most welcome addition to your Napoleonic Library. Fascinating, and highly recommended. 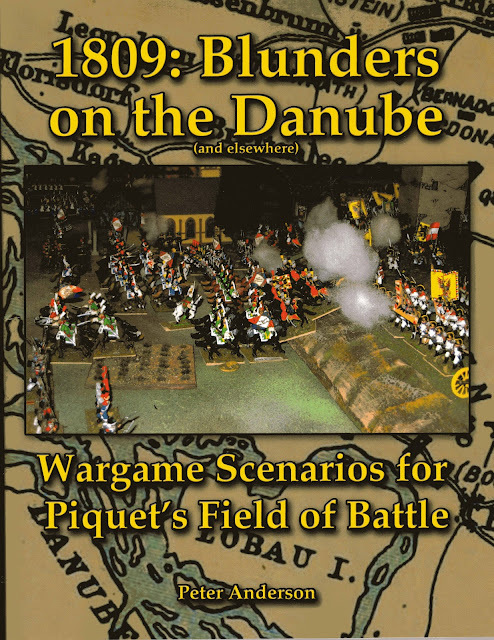 I wanted to take the opportunity to formally announce that the 1809 scenario book is now in print and available from Piquet. I'm very pleased with how it came out, and I hope that it will be useful to many of you, both for use with Field of Battle, and also other rules sets (with some adaptation, of course). Price: $35 US; 122 pages, 23 scenarios. Maps in full color. See the 1809 tab on this blog for many more details. Hiller's wing of the Austrian Hauptarmee became separated from the main body by the battles of Abensberg and Eggmuhl, and he retreated over the Isar at Landshut, A bitter rival of Erzherzog Karl, Hiller decided to turn on his pursuers in an attempt to inflict a significant defeat upon them. He caught Bessieres' command half over the Rott river at Neustadt. In this scenario, Wrede's Bavarian Division, supported by Jaquinot's Light Cavalry Brigade, must delay the Austrian attack long enough for the supporting French Division of Molitor to come up and cover their retreat. This is a quite manageable action for two players, here using Field of Battle rules and one unit for every 400 Cavalry, 600 Infantry or six guns. Set up: GM Mesko's Advanced Guard Brigade (foreground) advances on Neumarkt via the main road, whilst a long column of whitecoats under GM Bianchi, screened by the Chevaulegers of FML Vincent's command marches on the Bavarian left (background). The Allied position after their first MOVE: Jaquinot's LC in the distance, Minucci's Bavarian Brigade in the front, with Bianchi's brigade (I have substituted Baderners and Hessians for Bavarians on the tabletop for this Brigade) move up in support. Neumarkt and the River Rott are to their rear. Neumarkt itself, with a Bavarian battalion deployed near the cloister of St Veit. The Austrian 1st Column under FML Reus-Plauen, with FMLVincent's Chevaulegers in the lead. GM Mesko's Advanced Guard Brigade. Accurate fire by the Bavarian foot battery has knocked out the opposing Austrian Cavalry battery as it advances! Wrede consolidates his position, while the Bavarian Jagers take up a position in the woods that threatens the flank of Reuss-Plauen's long column. Reuss-Plauen advances boldly in an attempt to crush the Bavarian left and turn Wrede's flank! Mesko keeps the pressure on Bianchi, as the Grenz of his command attack the Bavarian line; one of the Grenz has fallen back in disarray as a result of Bavarian musketry ("Out of Command") - note the "chicken" marker behind them denoting same! The Bavarian Jagers have launched a bold (? rash) charge from their woods onto the flank of the Austrian column, but Reus-Plauen has coolly countered the threat with an Austrian battalion guarding the flank of his March columns. Supporting French artillery forces the Austrian Column to deploy before advancing further. The charge of the Austrian Hussars has routed a Bavarian battalion (seen in a mob moving to the rear), whilst the Grenzer move forward once again. Casualties litter the field where the Hussars rode down the Bavarian infantry! The Bavarian Jagers have defeated the Kaiserlick infantry battalion, but are now themselves very precariously placed, with the Chevaulegers now threatening to charge their flank in turn! Having bought sufficient time, Wrede has pulled back his troops and consolidated his position, as fresh French troops arrive to cover his retreat back across the Rott. This scenario was interesting, having the Austrians bear the burden of the attack, and needing to press the Allies in an attempt to crush Wrede before he can organize an effective fighting withdrawal. Barry and I played this one out a year or so ago, and Barry rolled very poorly for the Austrian Leadership die rolls, so the attack was rather slow to develop, and I was able to delay his attack long enough to make good my escape without suffering excessive losses. Historically, Hiller resumed his retreat after inflicting a significant check upon Wrede, as no matter what tactical success he might be able to achieve, the strategic reality was that he was isolated on the opposite bank of the Danube from Karl, with only relatively few potential crossing points available between his location and Vienna! Wrede was given an unenviable position to fight in by the over zealous pursuit of Hiller, as directed by Marshal Bessieres, but gave a good account of himself on this day, as did his Bavarians. This would seem to give the lie to Naopleon's famously pithy comment about the Bavarian officer folllowing the Battle of Hannau (1813), "Poor Wrede! I could make him a Count... but not a General!"